Furnishing your Home Decor should be a satisfying and pleasant activity, since in this phase it is transformed by something raw and inanimate, in an environment that covers the tastes, style, ideas and character of those who furnish it. Furnishing, therefore, means transferring a part of the self (exteriorization) to a place even before it begins to construct a part of the self. It is undoubtedly a delicate phase since there are decisive choices at stake: it is necessary to decide what stylistic imprint to give to the interiors, and what is even more important is to make ends meet, given that the furniture has a decisive impact on the budget. Spending time looking for offers and opportunities can save money and not a little. Imagining how your house will have to show up when it is finished is a huge advantage, as it allows you to eliminate all the superfluous and concentrate on evaluating only the variants that correspond to your ideal. Even those who do not yet have well-defined ideas for home décor: You will find some interesting ideas on possible furnishing solutions to be studied in depth and then evaluate specific products. It is also advisable to do a project that takes into account all the ideas and reflections that have matured, as it will certainly help when you are inundated with information material, prices, and estimates. The Internet is an extremely useful resource for identifying solutions for the home, as it is possible to view catalogs, request quotes and compare the experience of others considering that furniture products are not commodities, but shopping goods, that is high impact durable goods emotional. Only after selecting the products that fall within the set of possible solutions, it will be possible to contact the producers and plan a meeting, to see and touch and get information on the final price. Let’s see in detail the various areas of the house. The living room plays an important role, especially when it is the largest room in the house or when it serves as the main entrance: it must, therefore, be a welcoming, bright and with spaces suitable for passage. After the kitchen, the living room is the second most lived place of the house and becomes the first ever in the case of “open space” furniture, where the kitchen and the living room merge into one big solution eliminating walls or border elements. For Home Décor this is a very important matter now. As for the kitchen, the first fundamental distinction is between classic and modern style. In the classic, there are also the rustic and country variants, which can be easily introduced into new furnishing philosophies, or to support environments such as large taverns. The bathroom is the most intimate room, the area dedicated to the care of your body, where personal needs and needs for hospitality merge. It must be a “ready” environment to accommodate even external people, such as friends and relatives; it is generally the only room in the night department that is exposed to the judgment and use of others. The bathroom furnishing process is divided into several phases; the first must still take place in project time, in order to create all the plant and structural arrangements. Generally, the bathroom furniture recalls the style of the rest of the house but it is granted a greater customization for the special functionality to which it is dedicated. The latest home décortrends in the bedroom are the use of furniture with new colors associated with more classic materials such as glass. The new bright and vibrant colors give a touch of originality to the whole environment and help to improve the mood of the people who live there. The modern alternative to the use of colors focuses directly on the design accompanied by the white and the sobriety of the lines: the glass appears both “mirror” and satin, as the steel appears in the furniture or in the doors of the same. More information to help decision – making and allow you to do some mental order on the most suitable furnishing solutions, you can easily find on the web, for example in portals on furniture or in other information sites dedicated to the home. Before each choice of furniture, ask yourself what habits and ‘rituals’ domestic you want to indulge; which comfort you look for. You wanted an open, relaxed and convivial living despite the limited surface, but leaving visual ‘filters’ for entry and kitchen. You put the furniture on the walls and in the middle, you inserted ‘mobile’ elements (baskets, tables) to move according to use. Wood, natural fibers, leather details give authenticity and a sense of well-being. Nordic style cannot do without natural materials. Over time you have chosen to replace the darker woods, turning toward light nuances. 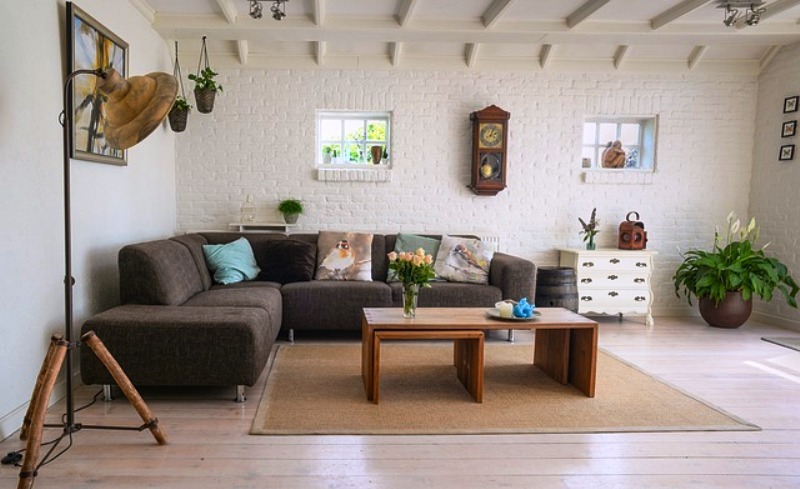 The only exception is the mirror above the sofa, a memory of friends (even the memories and your story are used to create an atmosphere for a nice home decor! ).